How to reach "Il Mulino". "Il Mulino" is located right in "Isola di Roccalberti". "Le Vigne" is situated a bit after, 250 meters from "Il Mulino" on the same road, in the omonymous locality "Le Vigne". To reach us take as a reference: Poggio, Camporgiano LU, Italia. Also on any navigator you choose this location. From Poggio to "Isola di Roccalberti". Arriving at Poggio follow the signs to Vagli. After 2.5 Km from the village of Poggio will be on your right a little cross-roads, follow the signs to "Isola Roccalberti". After 1 km you are in "Isola di Roccalberti". Servizio Taxi Criscenzo Elio; Colle Aprico, 4; 0583 618501; Mobile: 3355328293. The nearest railway station	is "Poggio-Careggine-Vagli", located in Poggio, 700m from the center and 4.2 km from the resort "Il Mulino". From this station you can easily reach Lucca, Florence, Cinque Terre (first until La Spezia, then slow train). For timetables and journey times: Trenitalia - Train timetable. There are different ways of communication to reach us. The road from Lucca is the most convenient, even if it is the longest coming from northern Italy. From the North the way Aulla. Coming from the Highway A15 Parma-La Spezia, exit AULLA. 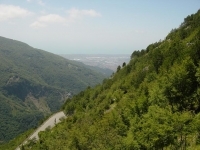 From here, the route is tortuous, however, is the shortest coming from the north (49 km from Castelnuovo). From Aulla continue on SS 63, Cerreto and then on SS 445 of the Garfagnana; pass through the Medieval village of Casola in Lunigiana. 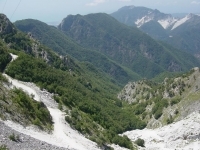 Continue towards Piazza al Serchio and then to San Romano (until now you drove 48 Km). Shortly after San Romano you find on your right a cross-road, follow the signs to Camporgiano. Once you reached Camporgiano go direction Poggio. 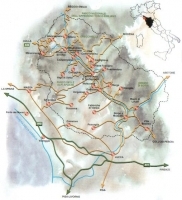 There are several routes, depending on the proximity in Forte dei Marmi, or Massa. 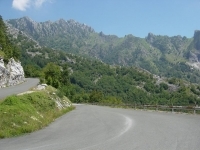 From Massa is advisable to pass through the Passo del Vestito (Antona, Arni, Isola Santa). 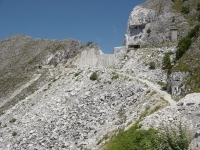 Some photos of the Passo del Vestito and the quarries of the Apuan Alps. From Forte dei Marmi is advisable to make the Pass Cipollaio through the homonymous gallery, the Gallery of Cipollaio: Seravezza, Ruosina, near Levigliani therefore Gallery Cipollaio. Continue to Isola Santa, to Castelnuovo di Garfagnana, then Camporgiano. 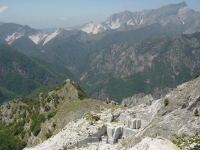 Da Est: From Reggio Emilia Pass Pradarena (km.130 from Reggio Emilia); From Modena crossing the Passo delle Radici (provincial road 72, Km.125 from Modena). From Abetone: state highway 12 of The Abetone Brennero. 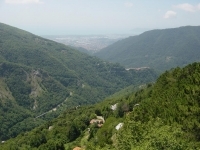 The Garfagnana is accessible by bus from Lucca and crossed by the railway line Lucca-Aulla. There is no one best way: if you do not suffer the winding streets, you can go to Aulla otherwise agrees to spend a little time and go from Lucca anyway (via the highway). The airport is situated on the coast, 1 km from the center of Pisa and just 80 kilometers from the center of Florence, and is accessible by any Means of Transporting of surface. The Airport is plugged directly into the Italian railway network with the station of "Pisa Airport". The Pisa Airport is the regional airport in Europe with the nearest railway terminal to the terminal (less than 40 meters connected by a covered walkway). Railway lines linking every day Pisa airport with the railway station of "Pisa Centrale" and the city of Florence. From the Airport you can buy your ticket at the Information Desk in the Arrivals Hall. The railway station is located just outside the Hall Check in.